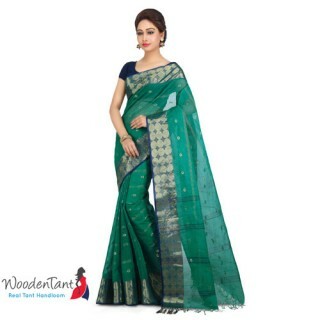 Freshen up your ethnic closet with this beautiful designer handloom saree from the house of Wooden..
Freshen up your ethnic closet with this beautiful designer handloom saree from the house of Wooden T.. 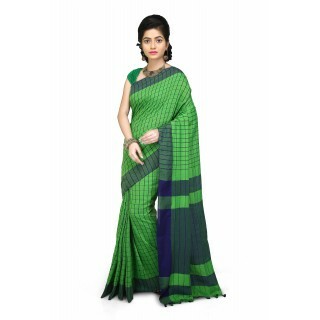 Wooden Tant Green Resham Silk Cotton Dhakai Jamdani Handloom Saree is exclusively designed by our ex..
100 Count Soft Cotton Khadi Saree With Thread Work.Key Features:1. Saree length is 6.5 me..
Key Feature : 1. Saree length is 6.5 meter and Width is 1.2 meter. 2. Made of finest quality fa..
Key Features : 1. Saree length is 6.5 metre with 0.9 metre blouse piece. 2. Us..
Woodentant Ikkat Tie Dye Cotton Silk Saree With Temple Thread Work Above The Zari Border. .. 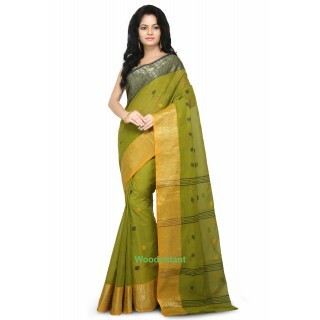 Lemon Green Box Ghicha Handloom Cotton Silk Saree with Hand Weaved Ghicha Border. Key Features: ..
Key Features:1. 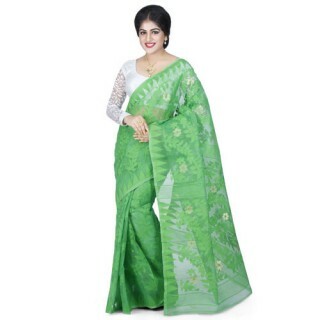 Saree length is 6.5 meter and Width is 1.2 meter.2.Made of the finest quality fabr..